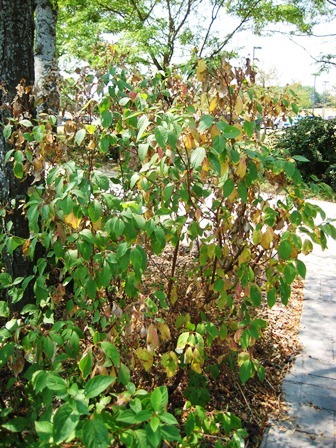 Many of our established woody ornamentals can survive periods of prolonged drought. 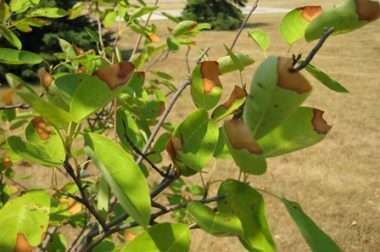 In response to drought conditions, some of our woody ornamentals, both native and exotic, can start the annual fall leaf defoliation a bit early during prolonged drought conditions. 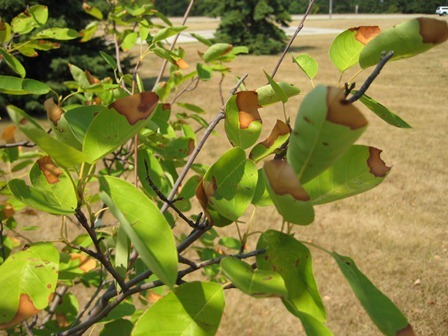 Leaves can also turn brown and curl on the edges and drop in mass quantities, particularly on species such as linden, birch, dogwood (red twig, yellow twig, pagoda, and Corneliancherry dogwoods), and hydrangeas. What can we do to help plants handle this dry situation? Water! The recommendation of 1″ of water per week per plant is very important, even in the fall. Watering is particularly important for herbaceous perennials, as their root system is not as extensive as woody tree and shrub roots. For recently planted trees and shrubs (within this growing season or last year’s season), watering is crucial for survivability. Since these plants do not have an established root system or adequate water storage potential, they must rely heavily on what is provided to them either from rain or from supplemental watering. 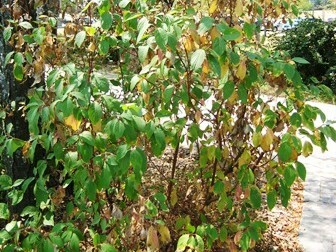 If these plants do not receive water, chances are they may suffer severe branch dieback or the whole plant may die. Mulching plants properly can help retain the moisture in the root system and reduce evaporation from the soil. When applying mulch, do not apply more than 2-3″ of mulch on top of heavy clay soils or 2-4″ of mulch on top of sandy soil. Excessive mulch around a tree will actually prevent good water percolation into the soil. Also, make sure the mulch does NOT touch the trunk of the tree. Keep mulch at least 2″ away from the tree trunk and avoid “mulch volcanoes”. Mulch volcanoes occur when mulch is over applied and piled against the trunk thereby creating a volcano look. Mulch touching the trunk of a tree or too heavily applied at the base of a shrub can actually invite unwanted pests (insects, voles) and diseases (cankers, basal rot) into the area. Watering amounts will vary based on soil type. Sandy soils will need more than 1″ of water a week (or 1.5-1.75” of water a week in severe droughts) since those types of soils dry out faster than loam or clay-based soils, which require 1” of water a week. When watering, be careful to watch for rate of application, as you don’t want all of the water to run off of the ground and into the ditch or sewer. Use of soaker hoses is very beneficial for watering plants in large shrub beds as water is applied over a longer period of time at a slow rate allowing for good penetration into the soil. If mulch is applied, place soaker hoses underneath the mulch to ensure water gets into the soil and not just in the mulch. Trees should be watered out to the drip line, if applicable. If you are just using a hose, don’t turn on the water pressure too high as most will simply run off the ground and into the ditch or sewer. At a slower rate, water from a hose will allow for deeper penetration of the moisture into the ground. Arborists can use tree root feeders, that are placed into the ground, for watering without the addition of fertilizers, unless needed, to help plants in drought situations. where x = number of gallons you need to add. Put in the number of square footage of your area and then solve for x. For example, if you have 100 ft2 area to be watered, “x” or the number of gallons needed would be 60. You get this by multiplying both sides of the equation by 100, with the right side of the equation canceling out and just leaving “x” and the left side of the equation with 3,000 gal. x 100 ft2 = 300,000 gal./ft2. Divide that number by 5,000 ft2, which then equals 60 gal. of water needed for your area. Once you have this figure above (number of gallons you need to add to the area), take a 1 gal. empty bucket and fill with water directly from your hose or other water source you plan on using. Fill the bucket very slowly as you don’t want the water pressure too high as it will runoff an area, especially if surface applied. For example, fill a 1 gal. bucket with water, but adjust the rate of application so that it takes 25-30 sec. to fill that bucket (if you are surface applying the water). If the water applied to the plants comes out at a fast rate, some of the water will simply runoff and away from your plants. Record the time it takes to fill the 1 gal. bucket. If it takes 30 seconds to fill a 1 gal. bucket at a slow rate of application, and you need to supply 60 gal. of water (based on the calculation above). You will need 1800 seconds or 30 minutes (1800 seconds divided by 60 seconds/minute) to thoroughly water the area. You get this by multiplying both sides of the equation by 60, with the right side of the equation canceling out and just leaving “x” and the left side of the equation with 30 x 60 = 1800 seconds or 30 minutes. Repeat watering as necessary, especially through a severe drought. You can adjust the rate of application, but don’t be in a hurry to apply too much water all at once as it will not penetrate the soil or get to the roots of the plants. Make sure to water both newly planted material as well as established plants during prolonged drought. Continue during the season and into fall and winter until the ground is frozen. If rain occurs, supplemental watering may not be needed, but check the soil moisture by inserting your finger as deep as possible around the plants or use a small soil probe to bring up a sample and check for moisture. If the soil feels moist, do not water. 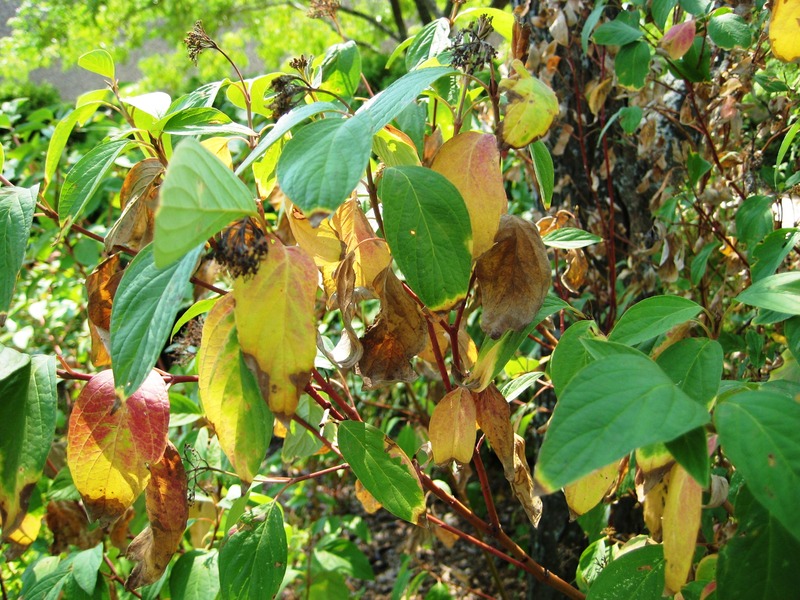 Ornamental plants will have a better chance of surviving a severe drought or transplanting if well hydrated. Woody plants, particularly evergreens (needle-leaved and broad-leaved), require adequate hydration to get through winter. 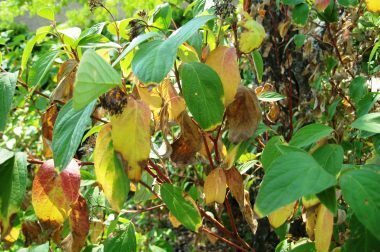 Deciduous plant material will usually come through winter, however, if the roots have not received sufficient water in the fall, the plants may die over winter. This can occur on native species as well as exotics. Evergreens need water, even in early and late winter, due to the fact that when the ground is frozen, the tops of the plants are still transpiring (loosing water) through their leaves. There is some amount of water that is stored within the stem itself but not enough to constantly replace the water that has been lost via the evergreen leaves on warmer winter days. When the ground is frozen, replenishment of water from the roots to the leaves is almost impossible. Therefore, watering all plants, especially evergreens and newly planted material, in the fall, up until the ground is frozen, is critical. The water will help hydrate the plant and increase survivability through winter. You can easily tell which evergreens went into winter with a severe water deficit; these evergreens shrubs and trees will have severe winterburn injury, even on plants that normally do not suffer from winterburn such as junipers. We see a lot of this type of injury each spring in Wisconsin.